Roping stirrups are typically larger than many other types of stirrups. While there is no set definition, roping stirrups are usually wider at the bottom than many other types of stirrups. A roping stirrup is designed to provide a solid platform for a roper to place their weight while roping. Roping stirrups are also preferred by many non-ropers because they find the wide stirrups comfortable. Below are roping stirrups for sale on eBay and Amazon. 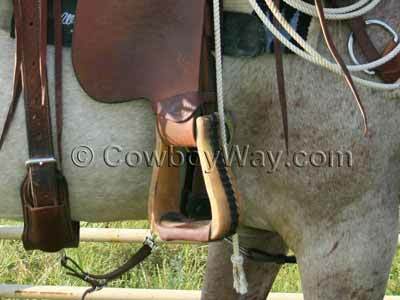 What are the roping stirrups made of? They might be made of some type of metal, wood, nylon (usually covered with leather or rawhide), some other material, or a combination of materials. ...at the top? Some sellers give this as an actual inch measurement (for example, "3 inches at the neck" or "3.5 inches at the top"), while others will state the size of stirrup leathers the stirrups will accommodate (for example, "made to fit up to a 3 inch stirrup leather"). ...at their widest point from side-to-side (which is usually at the bottom)? Roping stirrups are not all the same size. Be sure you get stirrups wide enough to fit the boots you'll be wearing and to suit your personal preferences. NOTE: It's not uncommon for people to own two pairs of stirrups: One pair for warm weather riding and a different pair for cold weather riding. The cold weather stirrups are usually larger to accommodate a larger, insulated boot. How wide is the tread, or the area where the rider's foot rests? The seller might call this the "tread" or simply just the bottom. In addition, some sellers will use the word "deep" to refer to the area where the rider's foot rests. TIP: About the word "deep" when shopping for roping stirrups......some sellers use the word "deep" to indicate how tall a roping stirrup is, but other sellers use "deep" to specify the width of the tread, the area where a rider's foot rests. Obviously, these are two different things so misunderstanding what a seller means when they say "deep" could mean you wind up with a pair of stirrups that aren't the size you thought they were. Read the description carefully to understand just what the seller is referring to if they use the word "deep." How tall (or long) are the stirrups? How tall the stirrups are can be very important. A man might need a tall stirrup to accommodate a larger foot. However, a woman or youth might find it easy to accidentally slip a foot through a tall roping stirrup, and will therefore be better off with a shorter one. Are the stirrups new or used? The majority of the ones we've seen are new but you can occasionally find a used pair. If you find a set of stirrups you like but you're not ready to purchase them right away, you can always add them to your shopping cart so they will be easy to find later. In most cases, Amazon will keep track of your roping stirrups, and anything else in your shopping cart, for 90 days. Later on, if you decide you don't want the stirrups after all, it's easy to click "delete" and remove them from your cart.